The sad truth is this: The editor of DonMarquis.com has absolutely zero musical abilities. He can’t read a note of music, and he probably couldn’t play a player piano if he could even find one. This is a shame, because two songs based on light verses by Don Marquis have been written by a world-renowned composer and are waiting to be heard and enjoyed, but they need someone to perform them. 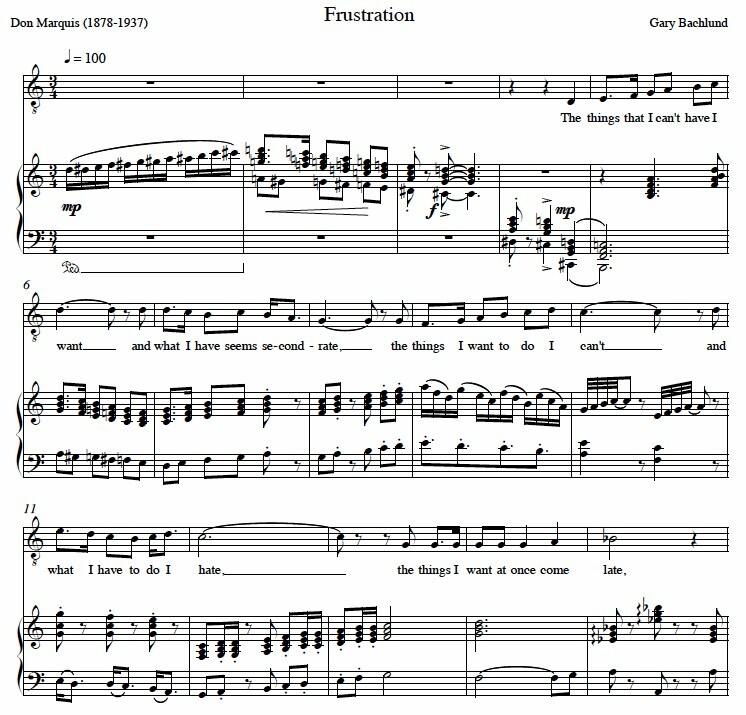 “A Seaside Romance” and “Frustration” are short, silly poems in Don’s 1921 book “Noah an’ Jonah an’ Cap’n John Smith.” They were set to music (for piano and tenor) in 2010 and 2011 respectively by Gary Bachlund, who won fame as an opera singer in the 1980s (Carnegie Hall, Metropolitan Opera, etc.) before switching to composition. Here’s where you come in: Do you play the piano? 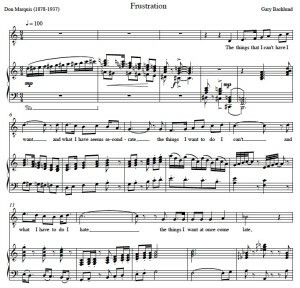 How would you like to take a look at the sheet music and give them a try? Maybe you could make a simple audio recording with your cell phone or computer and share it here with other Don Marquis fans. Or go ahead and cut a CD and make a name for yourself. If you know someone who sings and can accompany you, even better! Click on these links for notes on each compositions and a download button: “A Seaside Romance” and “Frustration.” Thanks! Bachlund, by the way, has also composed a full opera based on Lewis Carroll’s “Alice In Wonderland.” It was the subject of a Q&A interview last year on the Huffington Post website, which includes a link to a YouTube video of one of the pieces, “Prelude to a Golden Afternoon.” Enjoy. This entry was posted in News and tagged A Seaside Romance, Don Marquis, Frustration, Gary Bachlund, music, Noah an' Jonah an' Cap'n John Smith by John. Bookmark the permalink.